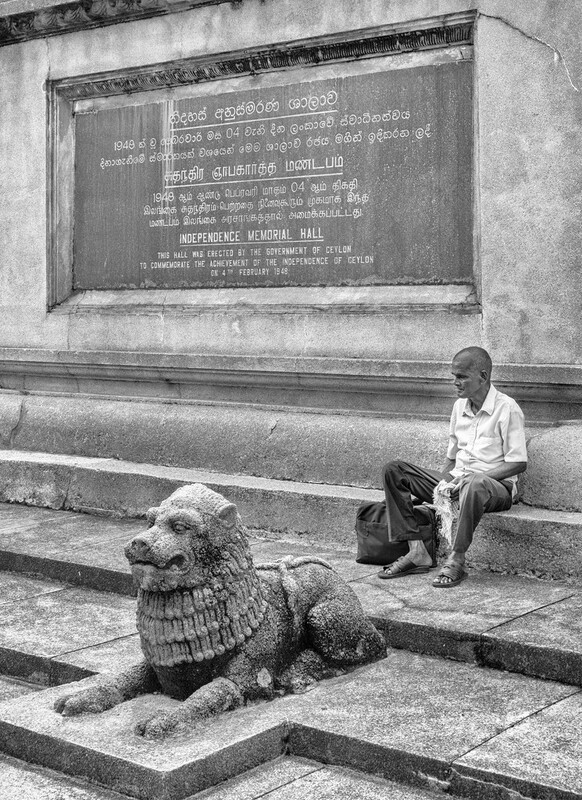 Sitting on the steps of the Independence Memorial Hall in Colombo trying to sell old coins and stamps to tourists. This shot really tells a story- such an excellent candid. How does the pantomime line go? Behind you. Love the storytelling here, and the positioning for the composition. Great street shot, Marnie. It tells a story. I imagine that would be a hard way to earn a living! He looks like he's had a rough time. Cannot be an easy way to eke out a living. I love the way you put them together. @onewing Sorry Babs, not a pantomime girl so can't help you. @taffy Thanks Taffy, I felt sorry for him and probably should've bought some of his wares but, to my shame, I didn't do that. You get so used to knocking back hawkers that it becomes automatic. @domenicododaro It tells a fairly common, though no less sad story. @merrelyn He'd make a pittance. @haskar @yaorenliu Thanks very much folks. @jgpittenger Makes you sit back and think, somehow more potent in the image than it was in the flesh. @samae Yes, he does look very sad, wish I'd just bought some of his stuff for him.